Chameleon Associates has worked with dozens of schools over the past few years, helping them make their campuses safer. In the course of our security consulting, one thing came up again and again: faculty and administrative staff were unclear as to how to identify and deal with threats, be they internal or external. We found an information and skill gap that needed to be addressed. School personnel were truly delighted to get training from us that raised their confidence level in addition to making security at their schools more effective. 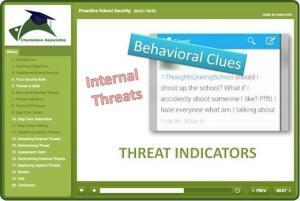 With this gap in mind, Chameleon has designed and developed an online course: Proactive School Security. We are pleased to announce this addition to our existing online training library. Online courses can be accessed by students any time and from any computer. This makes learning easy. Chameleon training is unique in many ways. We strongly advocate a proactive approach to security, not just the old ‘observe and report.’ Making a mental note of something suspicious is not what’s needed. That kind of mentality promotes passive behavior that will not make a school campus more secure. More now than ever, what is needed is for school personnel to be aware as to what to look for and what action to take when an indicator is detected. environment. Everyone from teachers to janitors, administrators, parents and of course, security personnel should know what indicators to look out for, how to quickly make an assessment and then what to do. Everyone has a role to play. Having across the board participation is in itself an effective force multiplier that is cost effective and relatively easy to achieve. What is the difference between Risk versus Threat? What makes someone or – something – Suspicious? To view a demo, for more information and to purchase, please link here. Posted in School Security, What's New at Chameleon?